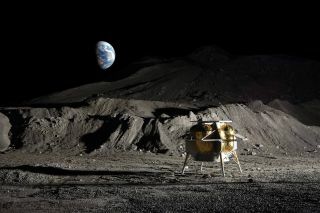 Artist's illustration of Astrobotic's Peregrine lunar lander on the surface of the moon. A private moon lander now has a ride to space for its maiden lunar mission in 2019. Pittsburgh-based Astrobotic's robotic Peregrine lander will lift off atop a United Launch Alliance (ULA) Atlas V rocket on its first trip to the moon's surface two years from now, representatives of both companies announced today (July 26). "Astrobotic is thrilled to select a ULA launch vehicle as the means to get Peregrine to the moon," Astrobotic CEO John Thornton said in a statement. "By launching with ULA, Astrobotic can rest assured our payload customers will ride on a proven launch vehicle with a solid track record of success." During the 2019 mission, Peregrine will carry 77 lbs. (35 kilograms) of payload to the lunar surface. Astrobotic has already signed 11 contracts with customers who want to participate in this flight, company representatives said. This first mission is a demonstration designed to prove out Peregrine's capabilities. Astrobotic envisions the lander eventually entering relatively frequent service, ferrying up to 585 lbs. (265 kg) at a time to the moon for a variety of customers, from government space agencies such as NASA to companies that aim to exploit lunar resources, Astrobotic representatives said. Peregrine may not be the first private lander to touch down on the moon, however, even if Astrobotic's 2019 schedule holds. Five teams remain in the Google Lunar X Prize (GLXP), which will award $20 million to the first privately funded group to land a robotic spacecraft on the moon, move it at least 1,640 feet (500 meters) and have it beam home high-resolution photos and imagery. These five teams — Hakuto, Moon Express, SpaceIL, Synergy Moon and TeamIndus — have until the end of the year to accomplish these goals; the prize expires after Dec. 31, 2017. Astrobotic was a participant in the GLXP, but the company dropped out last year.